KisoumanoSato Winter Horse Riding (木曽馬の里冬乗馬) is one of the great attraction in Kaida Highland, Nagano Prefecture. In winter, Kaida Highland will be covered with deep snow. And here in Kisoumano Sato has a great horse riding on the snow. It has a great scenery of winter with fresh air and view of Mt. Ontake. There is a long course of horse riding that you can enjoy the mountain forest. - Short Course: 500 yen 2 min. - Long Course: 1,000 yen 5 min. - Extra Long Course: 5,000 30 min. Horse Riding: 1,500 yen 15 min. 1. there is a shuttle bus to Kaidakogen Visitor's center. Note: Don't enter the track and inside of the fence. You can feed horses with grasses around the stable. Kaida Highland Kiso Horse Village is located at the bottom of Mt. Ontake, Nagano prefecture. There are restaurant with Soba School and a Stable. The stable has about 30 Kiso Horses. 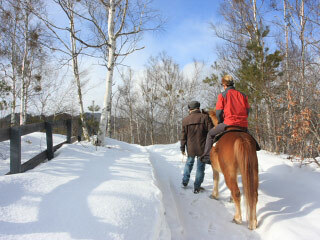 It offers horse riding, draft horse riding, wagon tour and sled tour in winter. It is free to touch horses. When the weather is good, you can touch and feed horses. Kiso Horse is the native Japanese Horse. They are short but very strong horse. Their average height is 133cm and has large stomach and powerful legs. They used to eat grasses at mountains. They had a very strong grass fibers. So, they developed long digstive organ. That's why they have large stomach. The land was sterile and they need to be this way. Kiso Horse can travel hard rock mountains with heavy loads. Kiso Horse Stable appears in the record of 530. Kiso Horse became very famous with the rise of Kiso Yoshinaka in 1180 at Genpei War. During Sengoku and Edo period, Kiso Horse was popular for the horse of Samurai.